I used to love Hassleback potatoes, but haven't had them in years--greatly because they are generally basted with olive oil or melted butter. Inspired by Cooking With Plants, I made a slightly different version tonight for dinner. They came out delicious! Wash and dry the potatoes well; do not peel the potatoes. 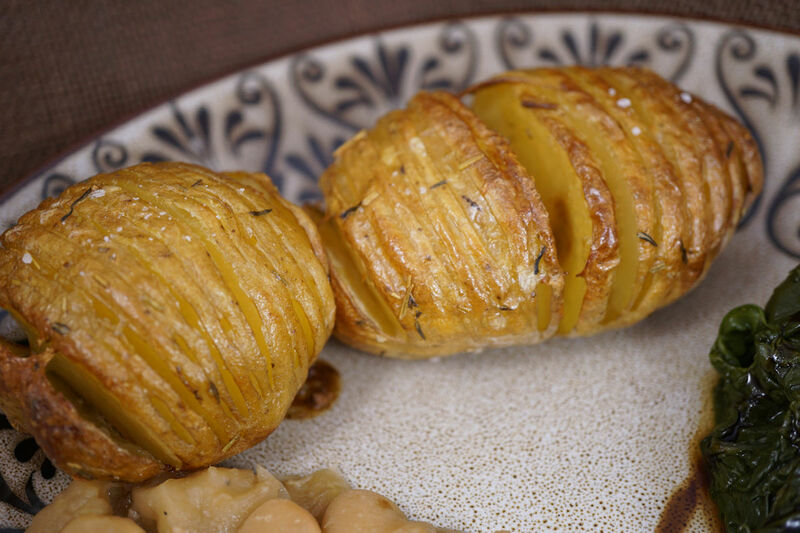 Slice each potato in narrow slices down 3/4 of the way so you don't cut all the way through the potatoes. Spread apart the slices a little as you go. If you need a more stable surface, slice a small amount off the bottoms so they sit flat. Place slice potatoes on a parchment-lined baking sheet. In a small saucepan, put in the cornstarch and veggie broth and whisk to combine well. Add in the garlic and dried herbs and bring to a boil to thicken. Turn off heat. Brush the potatoes with the thickened veggie broth mixture. Sprinkle with Kosher salt. Bake for 30 minutes. Baste the potatoes with the veggie broth mixture. Bake for another 15 minutes. Baste again. Bake for an additional 15-20 minutes. It should take approximately 1 hour total to bake these potatoes. Wow. It's recipes like this that prove you just don't need to cook with oil to make amazing, flavorful, melt-in-your mouth cuisine. I agree! It can be done. We just have to be willing to do some slight modifications. I will try this recipe today. Because I have an abundance of fresh Rosemary, I think I'll give that substitute a try. I'll let you know. thanks. That sounds AMAZING! I was just given a fresh rosemary plant as a gift. I will do the same next time!